On the outskirts of Jaisalmer in the arid state of Rajasthan lies the filled to the brim Gadisar Lake like an oasis in the heart of a desert. Back in the middle ages, there were no canals or irrigation system or other scientific methods to bring water to the arid regions of Rajasthan. This reservoir was built by Raja Rawal Jaisal keeping in mind the need of his people. 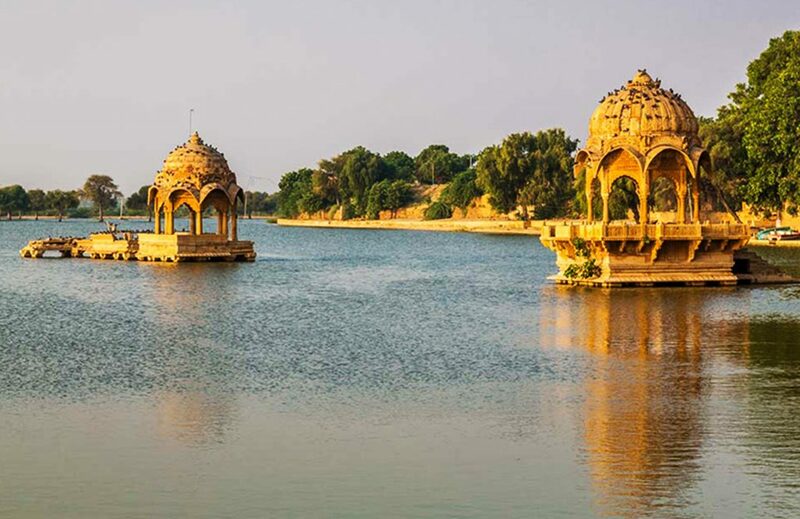 Located pretty close to the fort of Jaisalmer, the lake is frequently visited by travellers from all around India as well as foreigners. Gadisar Lake offers scenic views from all sides of the lake, especially when the eastern sky is blood red and the sun rises, striking its rays on the top floors of Jaisalmer Fort. Whether you like to spend some quiet time by yourself or have fun with your family, Gadisar Lake has a handful of experiences to offer. You can hire a boat and float around the lake, or you can walk around the embankment visiting the temples and feeding the tiny fish in the lake, or you can quietly sit, taking in the rustic appeal of the surroundings, clicking an occasional picture. If winter is your time of visit, you might just be lucky enough to see beautiful exotic migratory birds flocking in and around the lake from the nearby bird sanctuary of Bharatpur. The first thing you see when you visit the Gadisar Lake is the gate of Tillon that welcomes you to the beautiful surroundings of the lake. It is an archway artistically carved on rich yellow sandstone and forms a majestic looming entrance to Lake Gadisar. It was built and installed by a royal courtesan of the then ruler of Jaisalmer, in around the last few years of the 19th century. Much later, in 1908, a statue of Lord Vishnu was installed at the gate to declare it as Krishna temple and save it from the demolition of the then Maharawal. Tillon ka Pol has stood the test of time and speaks of the enriched artistic heritage of Jaisalmer till date. There are boat rides available at various rates, depending on the vehicle you choose. They will take you around the lake, and you can enjoy the real tranquillity the lake has to offer in solitude or with your near ones only, far from the crowd at the bank. Do not try to peek down from the boat or sit with your legs out – it is obvious to say that would be dangerous. If you visit during winter, migratory birds from the nearby Bharatpur bird sanctuary often fly to the lake and perch themselves on the banks or in the platforms in the middle of the lake. Their exotic beauty takes a visitor in awe, and if you are lucky enough, you might even see one fish for prey. Carry binoculars so that you do not miss such an opportunity. The lake itself offers a brilliant view to save in the mind’s memory or your camera’s. The beautiful lake offers a peaceful and serene surrounding to spend an hour or so. Otherwise, you can take a walk around the lake along its banks on the promenade and take snapshots of it from different angles. The mornings are said to be better for pictures, especially the sunrise. The calmness of the lake will soothe your soul if you are the quiet type of traveller who loves to observe and explore. The lake region is dotted with chhatris or raised platforms in the middle of the lake which was probably used by the kings or other royalties to enjoy the lake in seclusion. There are other shrines along the embankment and ghats with steps at occasional intervals. A distant view of Jaisalmer Fort can be seen from here – it looks mesmerising with the first rays of the sun hitting its peak creating a mystical game of lights and shadows. Capture the frame to keep it as a souvenir for your Jaisalmer trip. Carry a high-quality wide angle lens to capture the whole lake and its surroundings in its complete beauty. The lake is infused with scuffling shoals of catfish which often gather near the bank in a cluster if they feel a human presence in the hope of food. Feeding the fish sitting on the bank above, with small dry food like biscuit pieces or puffed rice is an everyday activity that people indulge in when they visit. 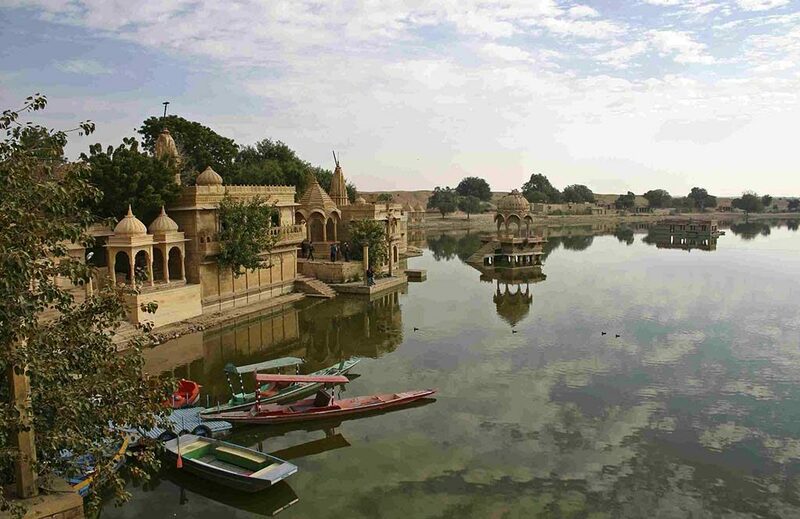 Gadisar Lake was built as a reservoir in around 12th-13th AD by the then ruler Raja Rawal Jaisal. He belonged to one of the bluest among the royal blood of Rajasthan and was the first king of the state and city of Jaisalmer. It can be easily assumed that the lake was dug up to make up for the aridity of the region. Because of a specific gradient of the land there, the area where the lake stands automatically was able to gather and retain some rainwater, whatever little it was there. In time, the lake became the life-saving source of water in Jaisalmer, acting as a reservoir and water conservation system. It was successful in fighting the water scarcity to a great extent. For this reason, many people believe it was a natural oasis in the middle of Indian Thar desert, but it is very much a manmade one. The pristine lake got its name from its renovator Maharawal Gadsi Singh who revamped the whole area in 1400 AD. It is said that the additional chhatris and a couple of shrines were his addition to the simple body of water. The lake was later named after him and got called Gadsisar Lake or Gadisar Lake.